The new Slide-Lok Tech Series brings a modern, streamlined look to your garage. The new Tech Series line features a stunning two tone thermofused finish. 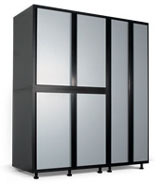 New options are available such as a heavy dutymetal storage chest and new flooring colors. Ask your authorized Slide-Lok dealer for more information. Everything Has Its Place... Optional drawers and drawer banks as well as the all new Metal Storage Chest provide additional ways to customize your garage. Matching Slat-Wall and accessories provide additional storage space while enhancing the overall look. With so many options and configurations, you will be able to create a place for everything in your garage.